Remapping, also known as rebinding is the practice of changing the function of a specific key on the keyboard or mouse to suit the user's preference. Some games do not support remapping; the methods on this page work around these limitations. AutoHotkey is an auto-scripting software for keyboards and mice, and is perhaps the most advanced remapping software, providing the ability to perform a number of other functions such as remapping mouse buttons. Because it remaps the keys itself, the program must be running for the new function to work. This perhaps makes it more useful when the user is wishing to rebind for a specific application, as it can be closed to return the keyboard to the standard layout. Because AutoHotkey doesn't make use of the registry Scancode Map, changes to mapped settings do not require a system reboot. This also means it is able to have limited functionality on older versions of Windows such as 95, 98 and Me. Capslock::Ctrl Makes Capslock become a Control key. To retain the ability to turn Capslock on and off, also add the remapping +Capslock::Capslock (this toggles Capslock on and off when you hold down the shift key and press Capslock). XButton2::^LButton Makes the fifth mouse button (XButton2) produce Control-LeftClick. RAlt::AppsKey Makes the right Alt key become the Apps key (which is the key that opens the context menu). RCtrl::RWin Makes the right Control key become the right Windows key. Ctrl::Alt Makes both Control keys behave like an Alt key. ^x::^c Makes Control-X produce Control-C. It also makes Control-Alt-X produce Control-Alt-C, etc. RWin::Return Disables the right Windows key by having it function like the Enter key. These utilities work by editing the registry. This affects the whole system so the AutoHotkey method is preferred. The registry can also be edited manually (not recommended). The KeyTweak user interface demonstrating a remap from Right Ctrl to Left Ctrl. One of the most popular tools in use, KeyTweak allows the relatively quick modification of keyboard key functions by displaying them graphically. To remap a key, the user must select the key whose function they wish to change on the displayed keyboard, then select the key they wish to map its function to using the drop down menu. Once this is selected, clicking "Remap Key" will begin the process of remapping, which must then be completed by restarting the system. Keytweak can also be used to disable keys by selecting the disable key option. This may be useful to prevent accidental key pressing when the user is not accustomed to a new or compact keyboard layout. The creator has also provided a detailed user guide to provide further information on the software and how to use it. It is available here. MapKeyboard is perhaps the fastest utility as it doesn't require installation (merely requiring the user to have Microsoft .Net Framework 2.0 installed), and is a mere 28KB in size. Its user interface is one of the simplest, displaying the keys graphically like KeyTweak and allowing the user to remap or disable keys in the same way, requiring a reboot due to changes to the registry. However, MapKeyboard also has the advantage of being able to remap keys to mouse buttons, a task which KeyTweak cannot perform. MapKeyboard is a little 28KB free software that lets you alter any key to a different function or also disable it. The freeware does not need an install. The only requirement is that you should have Microsoft .Net Framework 2.0 installed on your machine. MapKeyboard is very easy to use. Select the key you want to remap and using the Remap selected key to drop down, select the new key. Using the application, you can also map your mouse buttons. You can also disable any key you want. Click on Save Layout and with a restart, you have your remapped keyboard. This layout is preserved until you decide to revert to the default. Also, you don’t need to launch the program to use the new layout as the changes are saved in the registry. Always remember to revert the layout to the default before removing the program. 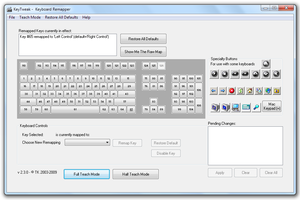 The SharpKeys user interface demonstrating a remap from Right Ctrl to Left Ctrl. 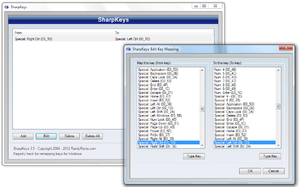 SharpKeys is similar to KeyTweak in that it requires an installation and is unable to map keys to mouse buttons, however, it does not provide a graphical interace, instead supplying the user with a list of available keys to remap. It is updated relatively frequently, however, as it makes use of the registry, changes will only take effect after a full computer reboot. 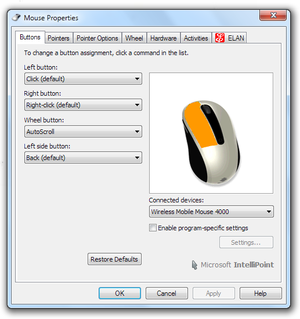 Rebinding mouse buttons using the Microsoft Mouse application. Microsoft IntelliPoint allows application-specific remapping for Microsoft mice (search for "Microsoft Mouse" once installed). Use Logitech Gaming Software for G-series mice or Logitech SetPoint for all other models. The SetPoint options for rebinding buttons are more limited than IntelliPoint. This program allows users of other mouse models to remap the mouse buttons. Changes can be universal or application-specific. Durazno allows remapping controllers in Windows games using XInput, including axes inversion. With x360ce you can intercept the mapping of controllers in Windows games using XInput. Use the DOSBox Mapper (Ctrl+F1) for DOS games running in DOSBox. Allow remapping of multiple different controllers to xinput, mouse, and keyboard in games launched via Steam. This page was last edited on 23 May 2018, at 19:04.